Tucked next to the reception desk of the main hotel lobby is The Signature Collection, a store of bedding, bath, apparel, sundries, stationery, and furnishings. Many of the hotel guests have commented on the quality of the items selected for the guest rooms in both the main hotel and tower. Now these unique pieces are offered for sale in the Signature store. 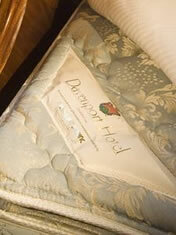 Custom made linens, luxurious bath robes, and plush Frette terry bath sheets can be purchased at the store. Also available are soothing bath products from Lady Primrose and, of course, the celebrated Davenport mattress. The Davenport "rests" its reputation on this matteress. 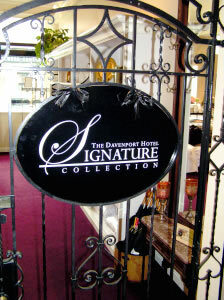 When The Davenport Hotel and Tower puts its name to something, you know it's an item of quality. You have their signature on it! Now you can order the fabulous Davenport Signature Collection on line! Just click here!